Back in the early 1980’s members of “MAD JACK’S” decided to revive the old Hastings custom of “Jack In The Green” and in 1983 the first “Jack In the Green” took place on the May Day Bank Holiday Monday. This was a very local event involving just “Mad Jack’s” and a few friends. 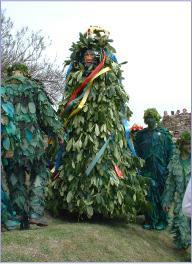 Over the years it has grown to the major event it is today and takes place over the whole May Day weekend. The highlight of the event is the procession on the Bank Holiday Monday which now regularly attracts over 1000 participants. In addition to “JACK” and his attendants, the mysterious “GREEN BOGIES”, it involves dancers, giants, musicians and assorted others. Crowds line the streets of Hastings Old Town to watch before converging to the castle to see “JACK” slain and the “Spirit of Spring” released. Although now organized and run through a committee, members of “MAD JACK’S” remain heavily involved, and in recent years have been joined by “Hannah’s Cat Morris in co-hosting the event.